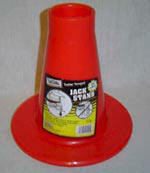 This jack stand chock is used on a bumper-pull tongue jack that does not have a wheel or foot plate on the bottom. The tongue jack is usually too short to reach the ground when fully extended, and it needs to have a prop put under it. Usually we see a variety of items used (block of wood, etc. ), but this jack stand is by far the safest! The end of the jack fits into the 3/4" lip at the top of the stand. The top indention is 2" across. The base is 8" across, and distributes the tongue weight evenly. 8 1/2" tall, with a 3/4" lip. Super sturdy & holds a maximum of 10,000 lbs. *Bright red/orange or safety yellow color--sorry, no color choice.